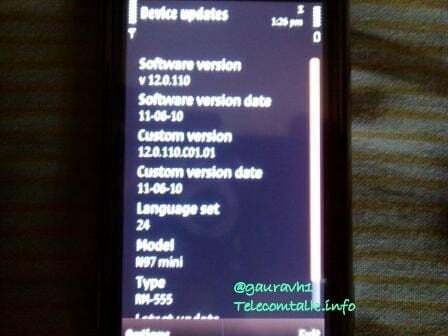 Nokia’s Nseries duo N97 mini has received a new firmware update today. The Nokia N97 mini has been updated to v.12.0.110 .There is no official changelog for update, however @gauravh1 a N97 min users quotes the new FW updates comes with battery management improvement and stability update. If the new firmware update is available for your product code, please share your experiences in the comments below. We’ll try and keep you updated as soon as we here more. New firmware updates generally contain bug fixes and optimizations necessary for the software on your device to perform properly, therefore we recommend you always keep your device up to date. There are many ways of updating the firmware on your Nokia handset type in *#0000# on the home screen or go to Device Manager. Then select Options, Check for updates and follow the on screen prompts,you can also update your firmware using NSU (Nokia Software Updater) and or Nokia Ovi Suite on your PC. Once you plug your device in, select the PC Suite option, ensuring that the phone has a Sim Card inserted and the profile is set to General. N97 mini supports UDP (User Data Preservation), which will preserve all your data and content on your device during these updates. However we still recommend you do a full backup in order to guarantee the safety of your data. there are updates, fixes availables for romanians to ?